Baseball guru Tom Tango noticed the WP graph for the recent Monday night meltdown had the Seahawk's chances at 0.01 prior to the game-ending play and thought it must be too low. He's correct. 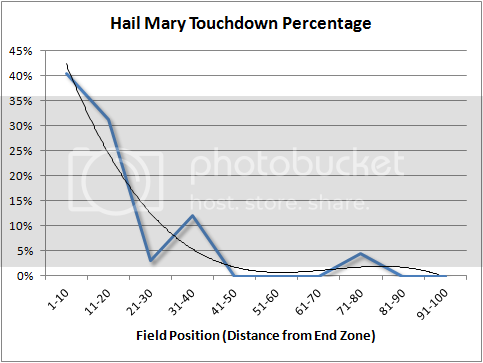 With all the attention on that final play in the GB-SEA game, I thought it would be useful to look at Hail Mary success rates. I looked at all the situations in which there were 8 or fewer seconds remaining (enough for one play) and a team needed a TD to tie or win (down by 4 through 8 points), and see how often they got that TD based on field position. This includes any plays that ultimately result in a TD, which would include any defensive penalty that enabled a subsequent scoring play. Even though SEA was specifically down by 5, the situations for being down by 4-8 are effectively indistinguishable for the purpose of estimating the chance they can get the TD. From the 2000 through 2011 seasons, there were 223 examples in total--a little over 20 per 10-yard bin of field position. The chart below plots the TD success rate in the sample. 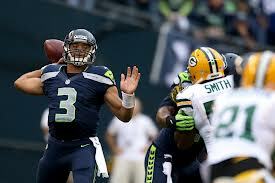 The Seahawks were at the 24 yd line, which would correspond to just over a 10% chance of a TD and winning the game. -The one indicated TD from the offense’s own 24 was from a 2003 NO-JAX game. I'm told that's an error. Thanks for the correction.